Holidays can be a crazy time of year. 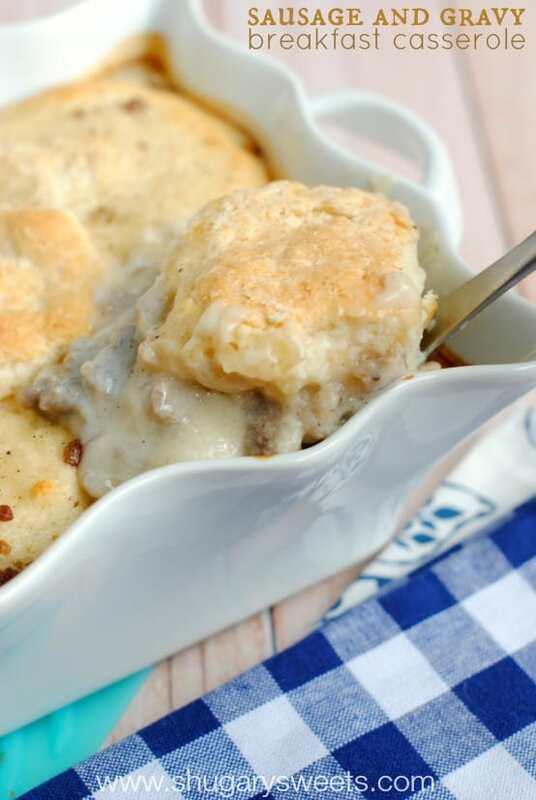 Get your day started with this hearty Sausage and Gravy Breakfast Casserole! Best part? 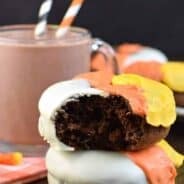 It can be made ahead of time! I don’t make Sausage and Gravy very often. We LOVE it, but it’s not something I think to make. As I’ve mentioned here on the blog, I hate making breakfast. I love eating pastries and muffins, biscotti and bagels. But all those can be made in advance. When my eyes aren’t so sleepy. When the coffee has been flowing through my veins. But now, friends, I’ve got a solution for you. Well, for me too! 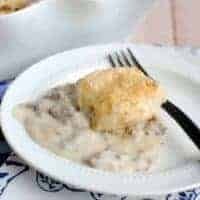 This Sausage and Gravy Breakfast Casserole can be made ahead of time. You can heat it up immediately, or prepare it (without baking) the night before. Then all you have to do is turn on the oven and bake. THAT I can do! It’s also a great dinner idea. My family LOVES breakfast for dinner. Serve with a big fruit salad and some extra biscuits with honey and jam, and dinner is done! 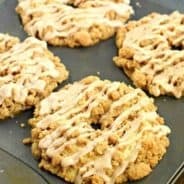 Speaking of the biscuits, I make mine using Bisquick Original Baking Mix. Always. Every time. For as many things as I make from scratch, some mixes is are just too easy, and too convenient to keep on hand! This is one of those things I have in my pantry at all times. Making meals ahead of time is such a life saver this crazy time of year. 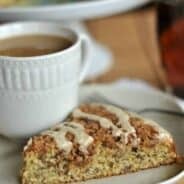 Whether it be breakfast, dinner or even dessert, check out the recipes from Betty Crocker’s Make Ahead Collection. So many great ideas! Thanks Betty! In a large skillet over medium high heat, cook breakfast sausage, chopping into crumbles as it cooks. Drain meat and grease from skillet. To the skillet, add the milk, flour, salt and pepper. Heat over medium and whisk constantly. Continue to whisk smooth until mixture begins to thicken. Add cooked sausage. Remove from heat. Pour contents of skilled into a 2qt baking dish. In a large bowl, combine Bisquick and milk. Mix with a wooden spoon until it becomes a soft dough. Divide dough into 8 large balls. Roll each one slightly then flatten in palm of your hand. 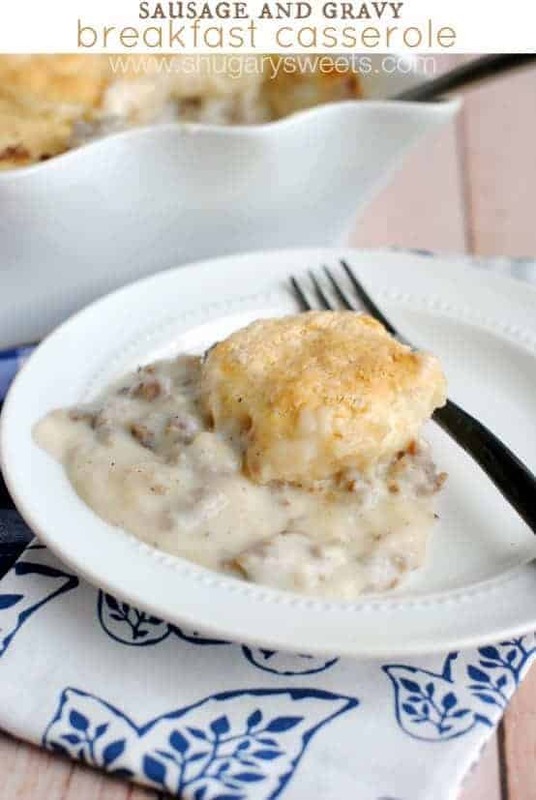 Arrange biscuits over gravy mixture (they may sink slightly, but will rise on top when baking). Cover dish with foil and refrigerate until ready to bake. Or, cook immediately. Bake in a 350 degree oven for 30-35 minutes, uncovered. If you don't plan to serve right away, refrigerate before baking. You can do this the night before. When ready to bake, remove foil and heat in oven. You may need to add about 5 minutes to your baking time. 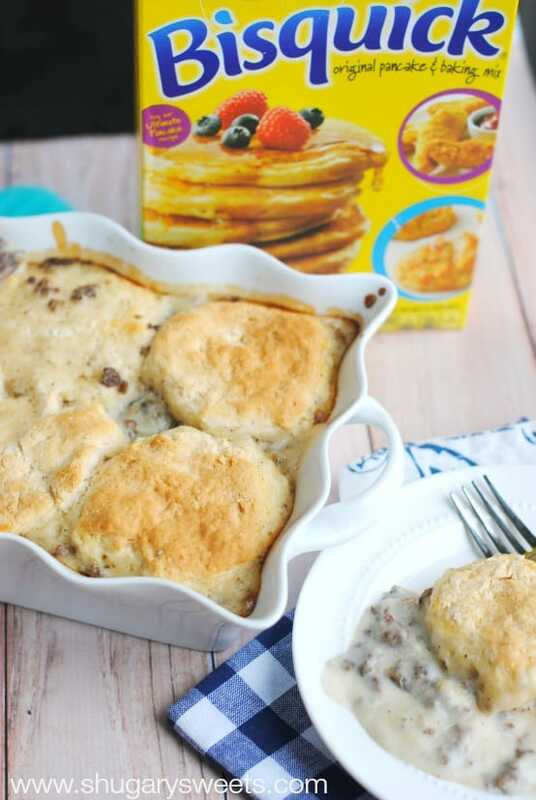 Cook until bubbly and biscuits are browned! Hi Aimee. I just found your site (courtesy of Six Sisters). I’m printing recipes like a crazy woman this morning, which my stomach is growling…. 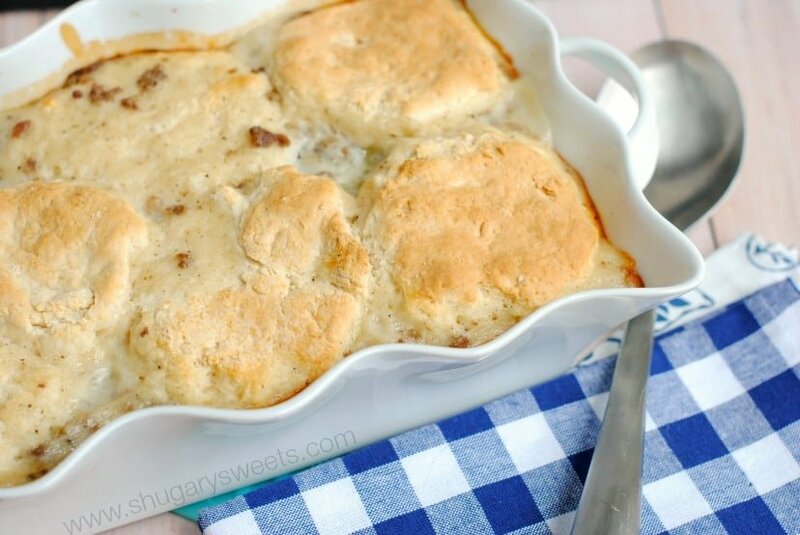 I know this post is a couple years old now, but I’m wondering — where did you find that lovely scalloped-edge casserole dish? I love it. I’m loving these thoughts & recipes. I’m trying new things, we were just in that “same ole same ole” rut. Now NEW ideas and plans. Thank you.